2000HP, 15,000RPM, 1,500 LBS/FT Continuos duty capability. Integrated dual starters. No bell housing, flywheel or starter required to test an engine. Inlet and outlet water control for precision load control and extreme repeatability. Compliant driveshaft driven with constant velocity joints at both ends. 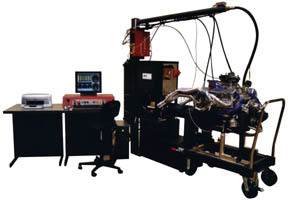 No need for precise engine to dynamometer alignment. Manual throttle and load joystick control as well as various automated programmable test sequences. The Powermark dynamometer system is manufactured and design for maximum durability and unequalled precision load control as well as fast responding to load changes with the dual water control valve design. Valves are stainless steel spool type design driven by a high-speed electric stepper motor. The design is precise in flow control and very fast in operation. Acceleration or sweep tests steady state or manual control the Powermark is precise in load control and extremely repeatable. Manufactured from a proprietary nickel aluminum bronze alloy castings with a huge 2" harden stainless steel mainshaft the Powermark is a rugged industrial grade dynamometer that provides years of trouble free service. PTFC water seals are utilized which have little rotational resistances while providing exceptional sealing and long life. Huge precise high speed bearings are utilized on the mainshaft and the entire brake assembly is supported at both ends in a roller bearing trunion assembly. Durable, trouble free, high load capacity and precision load control the Powermark is the best value in a dynamometer system.